The need for greater cloud computing services, whether it's IaaS, PaaS, SaaS or private cloud, helped push the market past the $180 billion revenue point in 2017, a 24% year-over-year increase, according to new research. By the end of last year, cloud computing had become the "new normal" for enterprise IT, with an ever growing desire for more of these services, especially infrastructure-as-a-service (IaaS) and platform-as-a-service (PaaS), according to Synergy Research Group. "Major barriers to cloud adoption are now almost a thing of the past, with previously perceived weaknesses such as security now often seen as strengths," John Dinsdale, research director at Synergy, noted in a statement. "Cloud technologies are now generating massive revenues for cloud service providers and technology vendors and we forecast that current market growth rates will decline only slowly over the next five years." Once again, Amazon Web Services Inc. and Microsoft Azure dominated when it came to IaaS and PaaS. When combined, these two cloud services grew at an annual rate of 47%, and this shows the growing reliance that businesses have on these types of services delivered through the cloud. The other category that showed significant growth in 2017 was software-as-a-service (SaaS), which grew at a 31% annual rate. 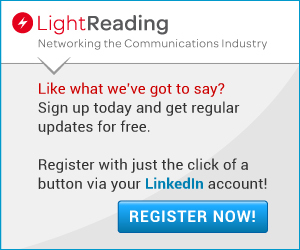 Once again, Microsoft and Salesforce.com Inc. , thanks to CRM for Salesforce and Office 365 for Microsoft, dominated this segment. 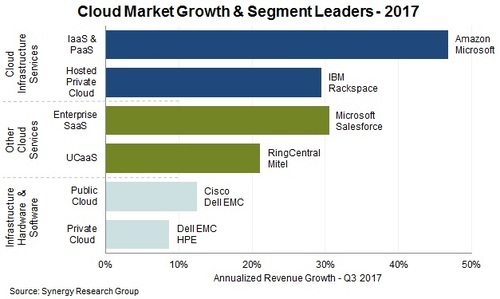 Hosted and private cloud grew about 30% between 2016 and 2017, with IBM Corp. (NYSE: IBM) and Rackspace as the two leading providers. Taken together, IaaS, PaaS, SaaS and hosted and private cloud accounted for about $100 billion in revenue last year. The other two segments are infrastructure -- hardware and software -- used to build public clouds. Over the last year, businesses spent about $80 billion on infrastructure, although spending on public cloud is now growing much faster. In the public cloud infrastructure market, Cisco Systems Inc. (Nasdaq: CSCO) and Dell EMC are the two biggest players, while Dell EMC and Hewlett Packard Enterprise dominate private cloud infrastructure.